Much against one’s inclination not to write on Pakistan, the growing chatter in the Indian media with Cover Stories and Columns dwelling on “Can Pakistan be Saved” to “Should Pakistan be Saved” pushes one to add one’s own bit and views on the tragic unraveling of a State that in any case was an artificial creation by Britain on her hurried departure from her Indian Empire. Both these questions in my view are redundant. How can Pakistan be saved if Pakistanis themselves are not ready or do not want to save Pakistan? Who else can save Pakistan? Neither the United States nor China nor for that matter of fact India can save Pakistan if Pakistanis do not want to save their own country. Both the United States and China have strategically used Pakistan as a “rental state” without bothering about the societal or economic development of Pakistan. They were content as long as the Pakistan Army which for the pecuniary gain of its Generals and for military hardware to be used against India collusively collaborated with the United States and China to strategically discomfit India. So why should India bother whether Pakistan can be saved or should Pakistan be saved. As I have written elsewhere India is militarily strong to deal with a Talibanized Pakistan and that bogey should not be bandied around. Before dwelling on the main theme one would also like to add that in this whole debate two vital ingredients are overlooked. The first factor is that despite the current turmoil in Pakistan, it is the Pakistan Army which continues to call the shots, courtesy its strategic patrons. And the Pakistan Army is decidedly rabidly Anti-India. More importantly, within India, the Indian public opinion is strongly Anti-Pakistan Army because of its proxy war and Islamic Jihadi terrorism sponsored by it against India. So, on both counts India gets ruled out of any role in the debate whether Pakistan can be saved or should Pakistan be saved. Western strategic analysts have a proclivity to project that it is only the Pakistan Army which is the glue that holds Pakistan together, One does not blame them because it is the Pakistan Army only within Pakistan which connives and colludes with external patrons for their own institutional gains. The economic or social good of the Pakistani people was never uppermost in the minds of the Pakistani Generals. Such projections are an insult to the ordinary Pakistani. In the explosive western frontier regions of Pakistan where the Pakistan Army is projecting that it is “aiding” the United States battle against the Taliban, let all people not be deceived that the Pakistan Army operations in South Waziristan are targeted against those Taliban who have been targeting the Pakistan Army whether it is the General Headquarters in Rawalpindi, other Army bases in Pakistan or Pakistan Army frontier outposts. 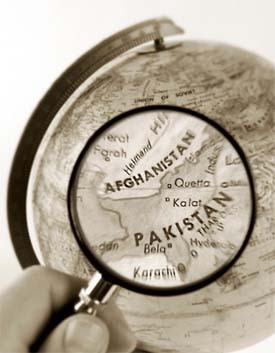 The Pakistan Army has not targeted the other Taliban. The Pakistan Army , if it was truly the glue holding Pakistan together, would have then not indulged in nurturing Islamic fundamentalists terrorist organizations of various hues from A to Z, whose agenda is so narrow and divisive that they not only endanger Pakistan’s national unity but also Pakistan’s external image and standing. The Pakistani people need to recall that what stands in between them and their emergence as a modern democratic Islamic Republic is the retrograde Pakistan Army with medieval mindsets. So how do the Pakistani people shake off the oppressive yoke of the Pakistan Army which has resorted to Army rule for more than half of Pakistan’s existence? The answer is not difficult to find and the Pakistani people know it themselves and exercised the power of their popular will. In 2007 and again in 2009 the Pakistani people spearheaded by Pakistan’s legal fraternity and aided by Pakistan’s civil society, women’s organizations and students and the ordinary Pakistani brought about General Musharraf’s exit and later the re-instatement of Pakistan Supreme Court’s Chief Justice by getting down on the streets and exhibiting Pakistani peoples power to great effect. The Pakistani people have within their power to force the Pakistan Army back to the barracks and brought under firm civilian control. United States and China would obviously not do this for the Pakistani people. An India making any efforts in this direction would provide the Pakistan Army a convenient handle to raise the bogey of an Indian threat and bring the Army back into the picture. The Pakistani people only have to save Pakistan themselves. I wonder were to startmy comment,its an old theory of india/pakistan sponsored enemity.Terrorisim ,is strong in both countries,india/pakistan,do not forget 5lakhs indian occupied forces in held kashmir,assam,telennago,and northern states /khalistan movement,and many others brewing quietly,against the Brahmins Rule. happens,then its fall outs shall give birth to new world order,at the detrimental interests of USA,RUSSIA,WESTERN COUNTRIES and CHINA. If history,is read All world wars and local skirmishes were directly proportional to the magnitude of economic/social requirements of the invaders,against smaller and weaker nations.